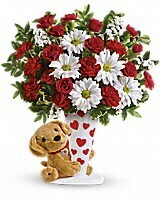 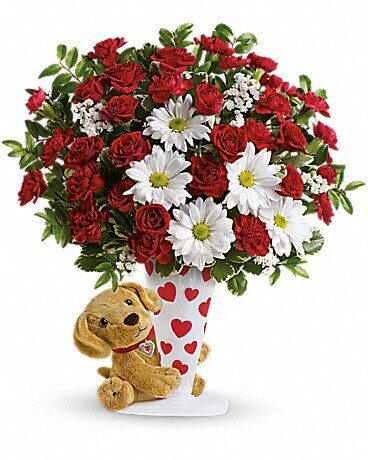 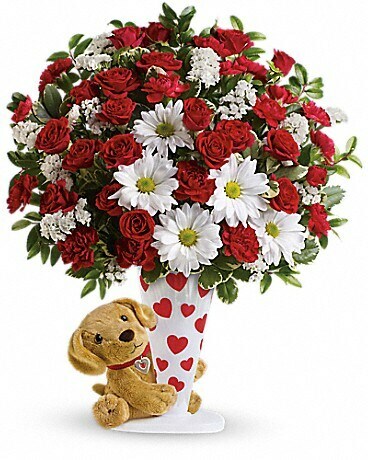 A doggone adorable way to declare your love this Valentine's Day, this delicate bouquet of radiant red roses and pure white daisies is hand-delivered in a heart-covered vase with a soft and cuddly stuffed friend. This frosted vase with hand-applied hearts, accompanied by an adorable plush puppy is part of Teleflora's exclusive Flowers-in-a-Gift collection. 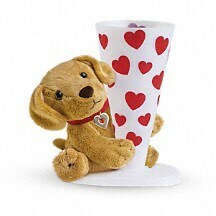 Cute and cuddly, this custom-designed, child-safe puppy is sure to be a favorite keepsake for sweethearts young and old.